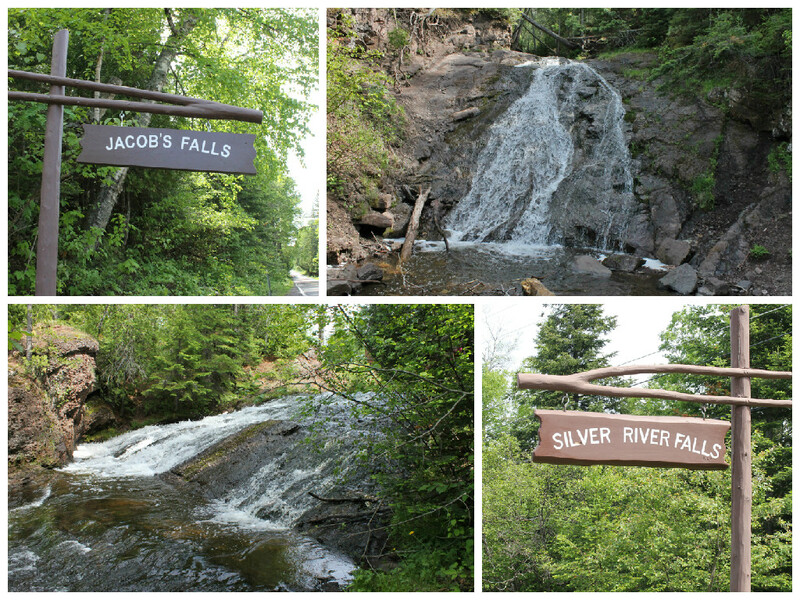 We headed to the west side of the U.P. on June 9th. Grateful that we didn't have any mechanical issues this time. Man we were busy - so bear with us on this blog it might be a little long even though it is only part one - or just look at the pretty pictures! Thanks for following us. We got our flags up! 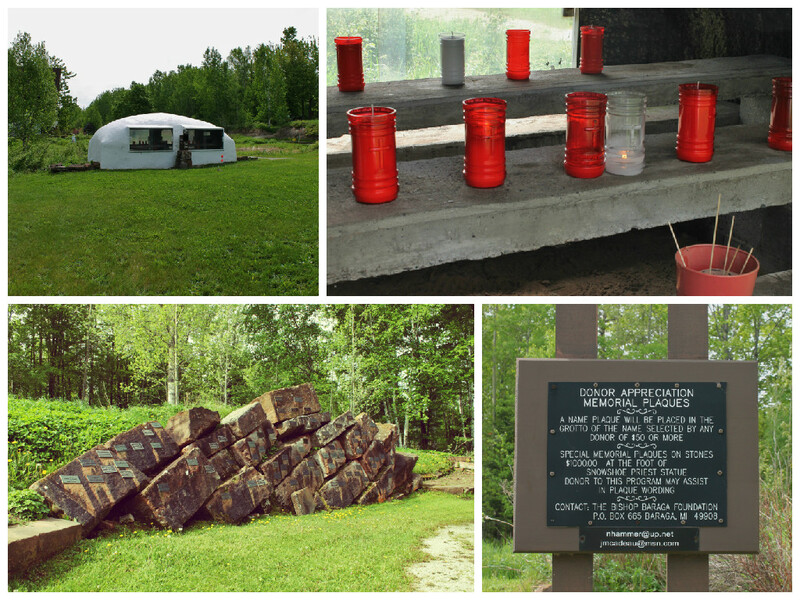 We are staying at the Summer Breeze Campground, in Iron Mountain. This is our favorite campground so far. Our site was huge, at least two other trailers could have fit on it. It was so nice not be crowed in. 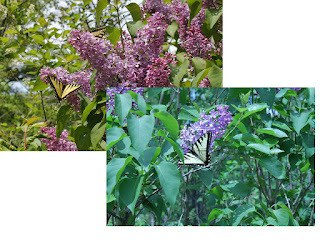 The grounds were well maintained, they have a pool and playground and hold an ice cream social every Saturday night. The bathrooms were very clean, as was the laundry room, which we had to use because our washing machine broke down mid load! The washing machine is still under warranty, so they are shipping a part to our next campground in WI and then a tech will come to our 2nd campground in WI to fix it. Jerry and Carol, the owners were great and ready to help with whatever you needed. The morning we pulled out we had a problem with the hydraulic jack again and Jerry came to the rescue with a heavy duty crowbar to help push it up. One of the best things about being here is there are hardly any bugs. No mosquitos to speak of and very few black flies. We even laid in the sun a few days and Mielikki loved being able to stay outside all the time. Nancy has had a terrible summer cold so having a few days to rest was very helpful, when she wasn't outside, her and Mielikki were napping on the couch. It's always interesting to see what other people do with their campsites. We see lots of flags of all varieties, the most being the American flag. We see a number of lawn ornaments and statues. This trip we ran across a cat lover. Their cat travels with them, which first off amazes us as most cats we know hate to go in the car. They have a small screened tent so the cat can be out on the lawn, but the best part is they had a cat door installed on the side of their trailer and they have a netted tunnel attached to it that sits on a table so the cat can come in and out. We thought our pet was spoiled. Getting a couple of days rest is really important when you cram a million things into every other day. One of our longs days took us up to the Keweenaw Peninsula. It is the upper tip of the Upper Peninsula. 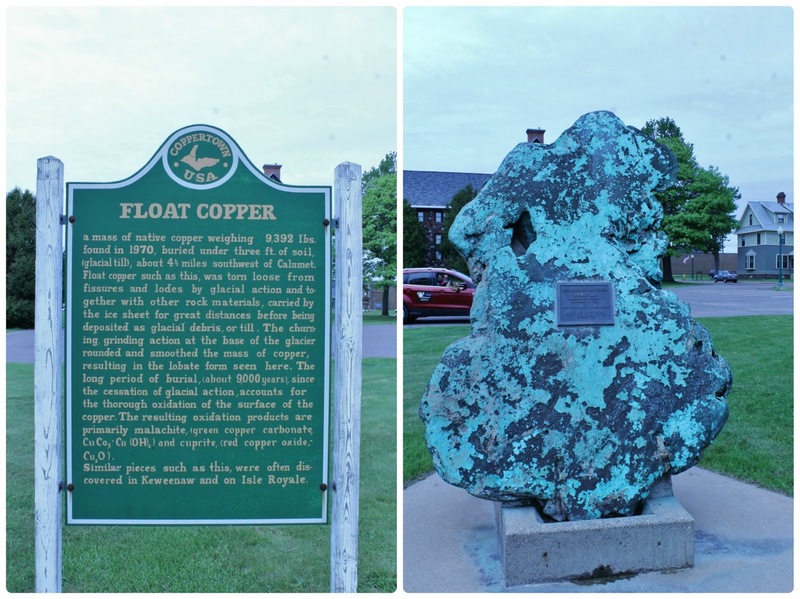 "Top of the World" is one name for it, and Copper Country is another. It was the home to many copper mines back in the day. To get there you go across the Lift Bridge, Houghton to Hancock. Of course there was construction but got a quick shot as we headed on. This sign is one you don't see everywhere! We stopped at the Quincy Mines just outside of Hancock. property, as well as a few intact buildings used on the tour. The mine is now a National Historic Landmark. There is a museum and underground tours. The mine opened in 1848 during what was called the Copper Rush. 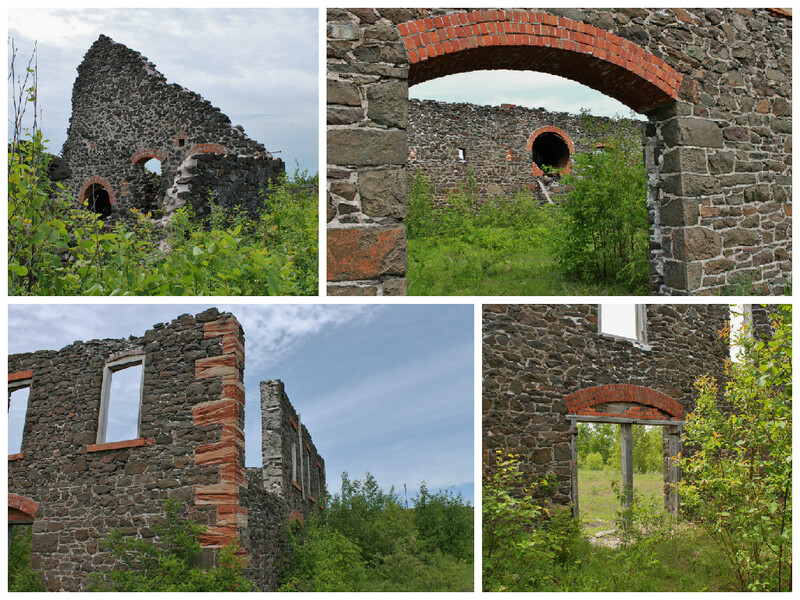 It was the second largest mine in the region by the late 1880's. It closed it's doors in 1945. There was this wonderful old train. Lots of rusty old equipment too - A photographers dream. While there we discovered that Paavola, was less than a mile away. This is the town that Nancy's mom was born in. With this information we can safely assume that this is the mine that her Great-Grandfather Aho worked at. It was a neat feeling for Nancy to walk where her ancestors walked. We drove through Paavola but it is pretty small now. There used to be a couple of stores but they have all closed up. Next stop was Calumet to see the Historic Calumet Theatre. 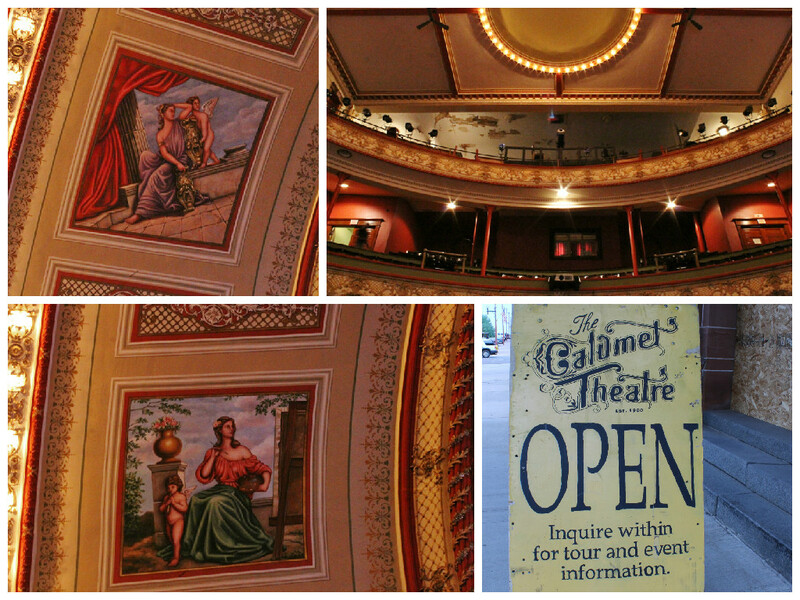 Opening night was March 20, 1900. The town at that time was called the Village of Red Jacket. 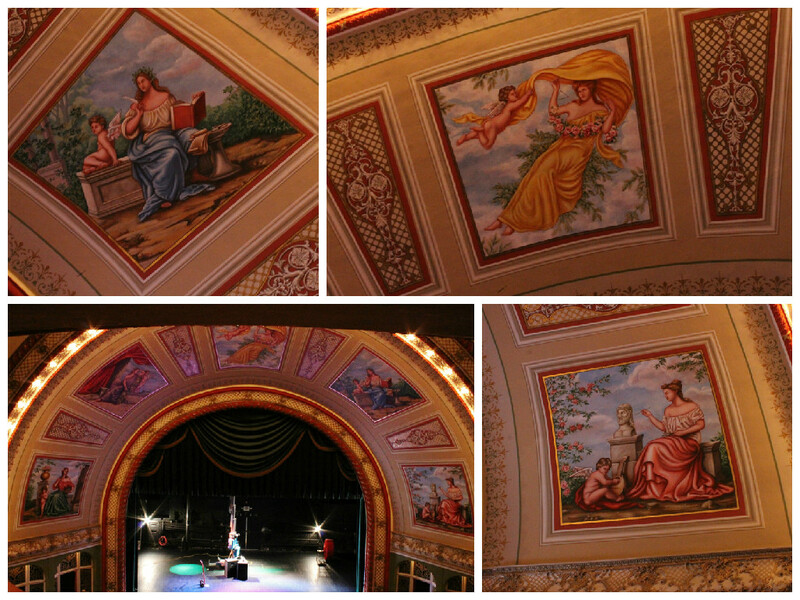 Sarah Bernhardt performed here in 1911 in "Camille". Lillian Russell performed in 1909. The current use of the building is for local theater groups, as well as a music venue. 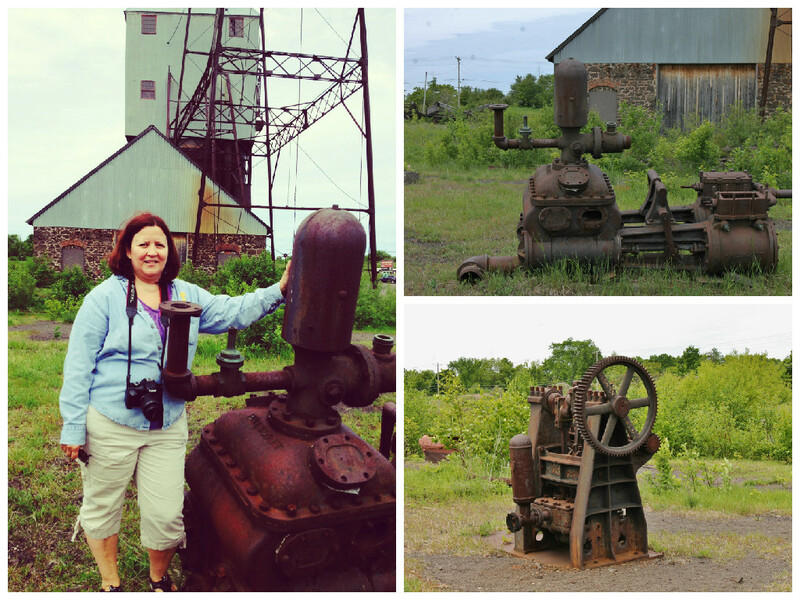 We stopped at a few other places while in Calumet. There are beautiful stone buildings everywhere. This one is the Historical Societies building, with a statue of the President of the Calumet mine on it's lawn. A piece of float copper and also, this snow train which we don't ever want to see in action. Off to Laurium we went to see the mansion of the Copper Barron, Thomas Hoatson and his wife Cornelia. All over Keweenaw Peninsula mansions were being built by the wealthy copper mine owners but none as large and opulent at this one. No expense was spared in building this 45 room home. At the time miners were making just 25 cents per hour, and this house cost $50,000 to build and an additional $35,000 of furnishings were added. It is now a hotel and they offer daily tours. While Nancy was taking this picture, there was a older gentleman sweeping his garage and he stopped and watched every move she made. 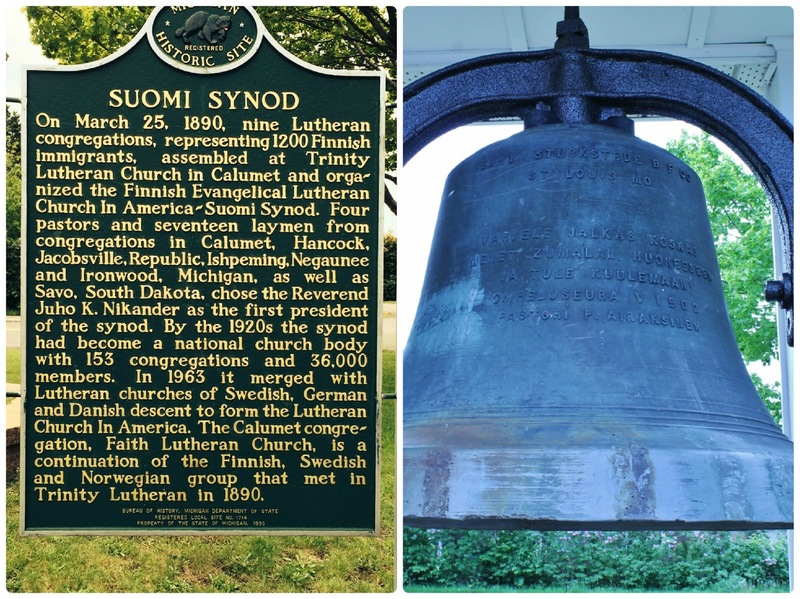 We came across an historical sign for the Lutheran Church, the Suomi Synod. The word Suomi is thought to mean land or swamp. 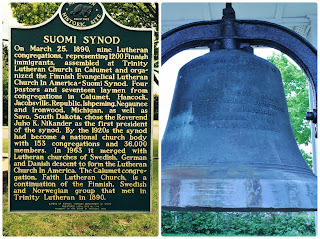 Next to the sign was this bell, but it is all in Finnish. So no idea what is says. 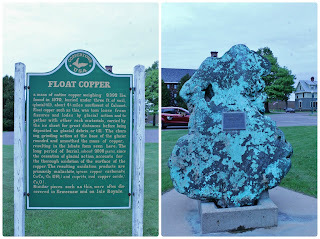 We drove Hwy 41 all the way to the tip of the Keweenaw Peninsula, to Copper Harbor. Stopped for pictures of the lighthouse and to wander the rocky beach of Lake Superior. Still a little early in the season for much to be open. 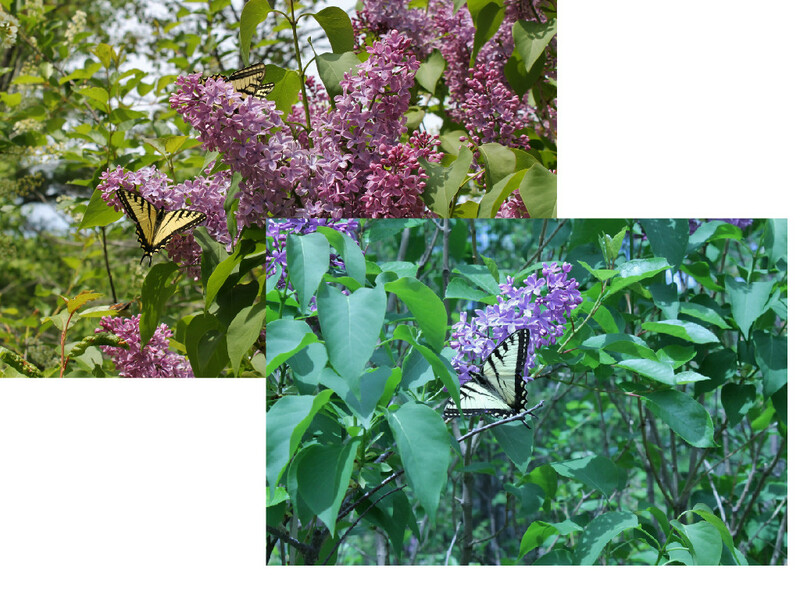 We found a Lilac bush filled with butterflies. We discovered that this is where Hwy 41 starts and it runs all the way to Florida. On the way to Cooper Harbor we came across this snow measuring stick - insane! This is why they have mailboxes like this and doorways on the second floor of their homes. We took Hwy 26 out of Copper Harbor which took us to Eagle Harbor lighthouse. The grounds had a number of artifacts and an information wall. Metal Bell Buoy - we could hear one ringing out in the lake while here. We came across two delightful roadside waterfalls. We helped a turtle get across the road safely. Remember if you help a turtle cross the road, always move him in the direction he is heading even if it doesn't make sense to you. We stopped at the coolest red rock beach after leaving Eagle Harbor. As we have been driving across the U.P. we kept commenting on the pink roads and wondered what made them that color. Well, now we know, all the red rock there is up here. Red rock bluffs pop up all along the shore on Hwy 26. One last stop of the day was to see the Shrine of the Snowshoe Priest. Abandoning a rich inheritance to serve God, Frederic Baraga came to America in 1830 and devoted the rest of his life to the Indians of the Great Lakes region. He mastered the language of the Ottawa and Chippewa Indian nations and developed their written language. In 1832 his first Indian Prayer Book was published in Detroit. His Chippewa grammar and dictionary are still used today. He was known far and wide among the Indian nations and was welcome in all of their villages. He moved to the U.P. in 1832 and traveled to Wisconsin and Minnesota between 1835 and 1836. 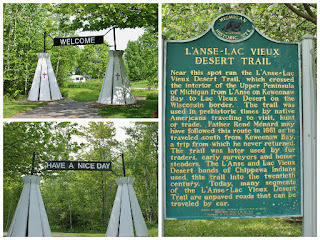 Baraga County, the site of his last major mission, was established in 1843. 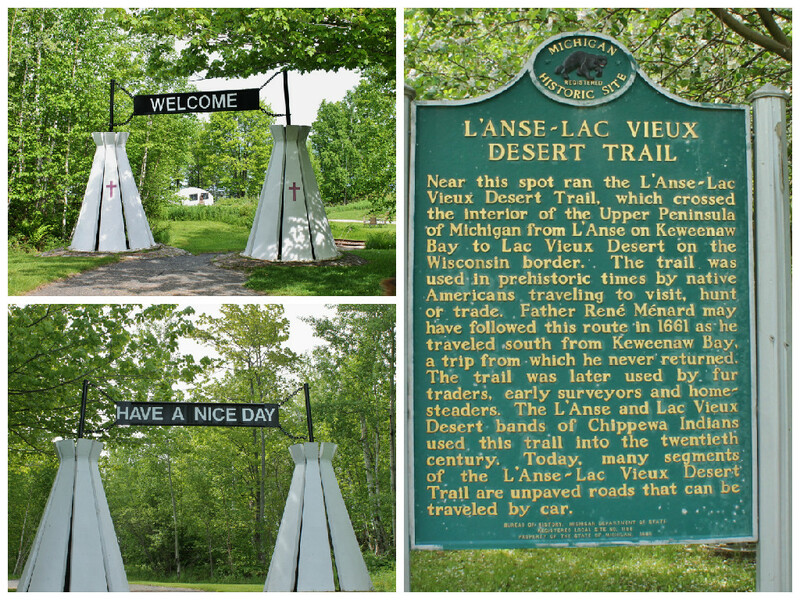 He remained here until he was elevated to Bishop in 1853, the first bishop of Upper Michigan. Snowshoes helped him to travel despite heavy snowfall. He was known to travel over 700 miles in one winter. Hence the name Snowshoe Priest. The metal sculpture rises six stories in the air. The cross he is holding is 7 feet high and the snowshoes are 26 feet long. The sculpture of Bishop Baraga is 35 feet tall and weighs four tons. It floats on a cloud of stainless steel supported by five laminated wooden beams which represent his five major missions. There is a small candle hut where you can light a candle and a large rock wall with donor plaques on it. The entrance welcomes you and the exit sends you off to have a nice day. This was just one day! The rest of our week will follow in the next post. Ants - the bane of our existence. Don't ever let your guard down. Hadn't seen any for weeks. When we arrived here Les opened the front panel to fill the washer fluid container and discovered that the engine was covered in ants! You guessed it we sprayed the heck out it and also inside in the cockpit area. We bought a tension rod that fits in our hallway, just outside our bedroom door. The perfect spot to hang clothes to finish drying. The rod stays up all the time - it is up and out of the way. If we need to get into the bedroom while the clothes are drying they easily slide aside.